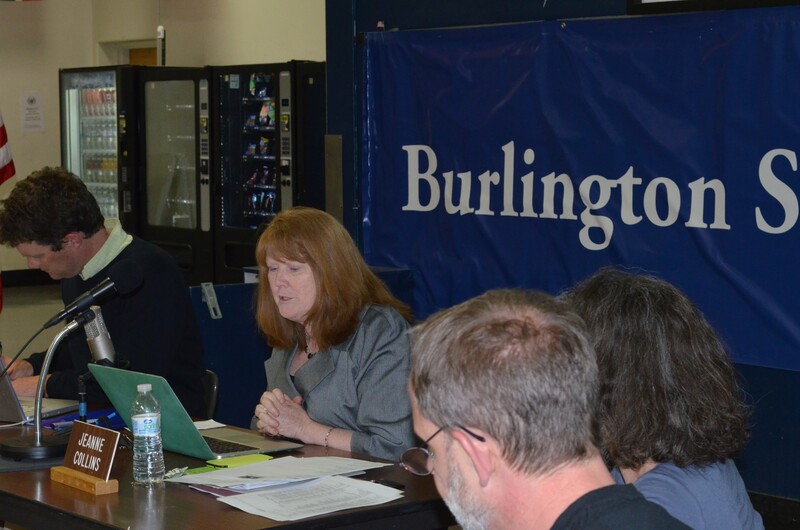 Jeanne Collins at the Burlington School Board meeting on Tuesday. The Burlington School Board and Superintendent Jeanne Collins are parting ways. The board unanimously approved a separation agreement Tuesday night under which Collins will step down on June 30. Collins, who took the district's top job in 2005, came under fire last month, when an independent report commissioned by the school board revealed that her office had been making serious budgeting errors. Those missteps contributed to a string of deficits, including one that had been "built into" the Fiscal Year 2015 budget that voters struck down in March. Board members have also complained that Collins was not providing them with adequate financial data. Two weeks earlier, Mayor Miro Weinberger and several city councilors publicly called on the board to bid Collins adieu. Board members gave no indication whether they would heed the suggestion, but according to the statement they released Tuesday, first began formally discussing the possibility of removing Collins on April 18 — 10 days before that city council meeting. Collins' contract will be cut short by two years — it was set to expire June 30, 2016. Her annual salary is roughly $130,000. As part of the deal, Collins will receive $225,000, which, according to the agreement, is "approximately half of the remaining value of her salary and benefits." She'll also be able to keep her district-issued iPad, phone and laptop. The agreement also includes a mutual non-disparagement clause, and the board has agreed to provide Collins with a letter of recommendation. School board members and Collins declined to comment on the decision because the agreement stipulates that there be no discussion of the matter beyond the joint statement. Board chair Patrick Halladay also noted that the board has appointed a sub-committee of members that will begin searching for an interim superintendent "extremely quickly." By next Monday, they hope to have a list of possible candidates, and if everything goes according to plan, the board will select someone by June 1. A small crowd of supporters lined up after the announcement, hugging Collins one by one. Board members quickly scattered to attend another executive session on what they said was an unrelated matter. The joint statement praises Collins' work and lists a number of accomplishments under her tenure, including the creation of two magnet schools and the Partnership for Change initiative, made possible by nearly $4 million in private grant money. On behalf of the board, Halladay takes some of the blame. "There is shared responsibility for the current financial situation. The Board could and should have asserted more oversight, and the superintendent could have managed the situation differently so as to have avoided the current situation." In her statement, Collins lists some of the challenges she was up against. "There were many factors that contributed to the financial challenges of the past few years — from personnel issues in the finance department to alterations in state and federal funding formulas to the need to update our accounting software." But, her statement continues, "as chief executive of the district, I am responsible for properly managing the finances."